Presenting giftware without using some form of obtrusive vertical support has always been a problem for store designers. Abstracta is our favorite solution. 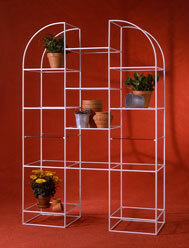 Abstracta uses 1/2" diameter steel tubes and a series of connectors, shelf holders, and shelf panels to allow the design of a variety of fixtures and displays. Because the tubes are available in many standard lengths we can create merchandising units in different sizes to support everything from collectibles to plush. Because the tubes are so narrow they don't block the view of the merchandise from any angle. 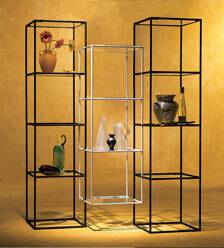 Abstracta is totally modular and may be assembled and dismantled as required. No tools other then a rawhide mallet are required.